Moïse Katumbi Chapwe is a Congolese political figure. A leading advocate of democracy and the rule of law in the Democratic Republic of Congo, he is the main opponent to Joseph Kabila’s regime and a candidate for the 2018 presidential election. Named “Personality of year 2015” by the magazine Jeune Afrique, he was Governor of Katanga, DRC’s largest province, from 2007 to 2015. In 2017, a survey by the Berci institute and the Groupe d’étude sur le Congo (GEC) ranked Moïse Katumbi first for voting intentions in view of a presidential election. 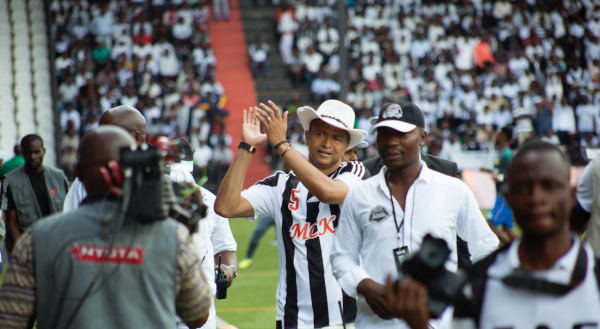 Since 1997, Moïse Katumbi has been President of the Lubumbashi football club, the Tout Puissant Mazembe. Through his leadership, his professionalism and the discipline created in the club, he has taken the TP Mazembe to the top of African football. Under his presidency, the club has been five times African champion and reached the final of the Club World Cup in 2010. Before entering politics, Moïse Katumbi had a career in the private sector. He initially prospered in industrial fishing and food supply. He then diversified to transport, trade and mining. In 1997, he created the Mining Company Katanga, since then acquired by the French group Necotrans. In January 2007, he was elected governor of the province of Katanga. Infrastructure development, increased investments, access to healthcare, drinking water and education, good governance, his track record and his many achievements have been praised both by the Katangese and by international observers. After 8 years at the head of Katanga, Moïse Katumbi resigned in September 2015. He deplored the maneuvers aiming to maintain the incumbent President in power longer than the two constitutional terms and denounced the power’s totalitarian abuses, notably its attacks on freedom of expression and arbitrary arrests. Since then, he has become a victim of judiciary, physical and political harassment on the part of the power in place. Responding to calls from several coalitions of opposition political parties, notably the G7 group, he announced his candidacy to the presidential election of May 5, 2015. He is a member of “RASSEMBLEMENT”, the Congolese political opposition platform. Moïse Katumbi Chapwe was born on December 28, 1964 in Kashobwe in the Bemba ethnical group, of a Congolese mother and a Greek father, Nissim Soriano, who fled the island of Rhodes, then controlled by fascist Italy, in 1945,. He established in Katanga, where he developed a fishmonger activity, later taken over by Moïse’s older brother. 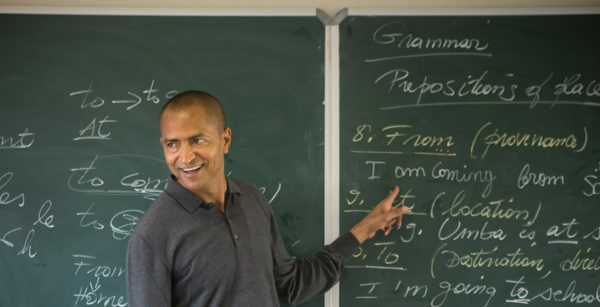 While studying at the Kapolowe mission, Moïse Katumbi started working in the family business. During the summer, he travelled in the fish loaded trucks between Lake Tanganyika and Cape Town in South Africa. Aged 18, he worked with his brother who managed the family business; as for him, he drove lorries and carried boxes. While still at boarding school, Moïse launched his first industrial fishing company and prospered through hard work and keen business sense. He got his supplies from Lake Moero and notably worked for Gécamines, one of the country’s major companies. After a few years, he diversified his activities beyond food supply, to transport and trade. In 1987, he created MCK (Mining Company Katanga), specialized in services to mining industry activities: mineral sourcing and transport. The company prospered quickly. In addition to MCK, Moise Katumbi developed multiple activities in DRC, and also during his years in exile, in Zambia and South Africa. When he became Governor, he retired from business and bequeathed his company. His personal wealth gives him independence, a fact appreciated by the Congolese people, as he is not using politics to become rich. Indeed, when he returned from exile in 2002, Moïse Katumbi was already wealthy. In November 2015, the MCK company was sold to the French logistics group Necotrans. The multiple activities he developed before entering politics, in Congo, Zambia and South Africa have made him one of the major African entrepreneurs of the beginning of the 20th century. Under his presidency, the club won 3 of its 5 victories in the African Champion League (1967, 1968, 2009, 2010 et 2015) and reached the final of the Club World Cup in Abu Dhabi in 2010. TP Mazembe is the first non-European or South American club to reach this level of the competition. The club also won the CAF continental cup in November 2016. In addition to the sport aspect of this venture, Moïse Katumbi developed infrastructures and training with a state-of-the-art stadium in 2011 with a capacity for 18,000 people. It was the first private stadium in the country. The same year, a football academy opened for the training of the elite of African football. Moïse Katumbi has served at the FIFA Strategic Commission since January 2012. In January 2015, he received the “Football leader of the year” award from the African Football Confederation. Moïse Katumbi has loved football since he was a teenager. At only 17, he acquired a first local football club. Since 1997, he has been the President and owner of the Congolese football club, TP Mazembe. He introduced a professional approach similar to that of major world clubs, with discipline and work ethics and managed to restore this iconic club of the African continent to its former glory. The Katumbi Football Academy opened in the Plateau area of Lubumbashi on January 11, 2012. Its objective is to train the elite of African football. Major works in 2015 have placed the academy at the same rank as the most modern centers in the world. The Academy is managed by Régis LAGUESSE, a French technician famous for having worked at the Abidjan Academy with his countryman Jean-Marc GUILOU. LAGUESSE is assisted by two coaches: Frenchman Damien OLLIVIER and the former TP Mazembe international player Willy MUGONGO, nicknamed “Fish”. The Academy focuses mainly on the recruitment of Katangese talents. As regards to the cultural aspect of their training, Academy students take the DELF (Diplôme d’Enseignement en Langue Française) every year, in conjunction with the Lubumbashi Alliance Franco-Congolaise. In response to a wide call from the population, Moïse Katumbi entered into politics in 2006 and was elected deputy of Katanga, with more than 100000 votes in his favour, making him the best elected deputy in the country. Immediately after, he was elected Governor of the province of Katanga in January 2007, with 94 votes on 102. As Governor of Katanga, Moise Katumbi developed the province as never before. With his result-based approach, quality requirements, effective management and daily work, he made Katanga a pilot province and the prime contributor to the national budget. During his two terms, Moïse Katumbi improves the business climate and restores order in the province. It fights corruption by promoting good governance, while ensuring that people benefit more from the province’s immense wealth. 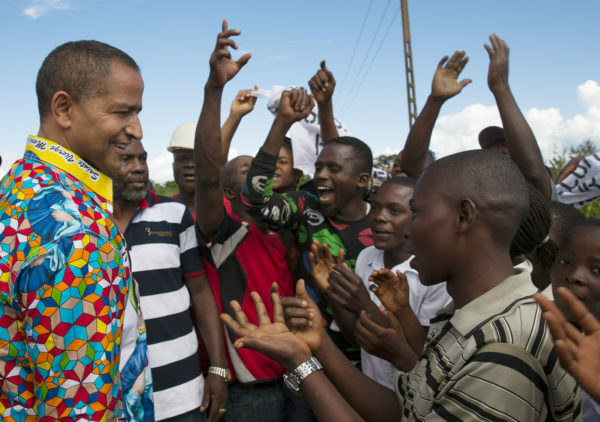 Over the course of his two terms, Moïse Katumbi improved the business climate for mining investments by fighting against corruption and promoting good governance, while ensuring that the population benefited more from the province’s great wealth. As soon as he arrived at the head of Katanga, Moïse Katumbi implemented a ban on the export of raw minerals, forcing industrialists to build their transformation units in Katanga, and thus creating jobs for the Katangese. In 2010, after the fall in price of copper and the hurried departure of mining companies (mainly Chinese) from the Katanga region, Moïse Katumbi asked all companies involved to pay rent compensations and taxes owed to the province, under penalty of auctioning their assets. From 2008 to 2013, the Katanga’s copper production went from 800 tons to 1 million tons a year. Moïse Katumbi made infrastructure construction a priority of his action. The main roads of Lubumbashi were tarred and several main roads were renovated and surfaced. Between 2007 and 2015, more than 3200 kms of dirt roads were rehabilitated and 1500 kms of roads were surfaced. Construction of the 710m long Lualaba bridge, the largest concrete bridge in the country that can carry 100 tons. A hydro-electric power plant was built on the Luapula river in May 2013. Several hospitals were also built; the renovation of schools and universities brought the school enrolment rate from 300 000 children in 2007 to 3 million in 2015. Between 2007 and the end of 2012, the share of population with access to drinking water went from 48% to 70%. Over the same period, the price of the ton of corn (maize) flour fell from $2200 to $500. As for agriculture, since 2008, a decree obliges all mining companies in the province to develop 500 hectares of agricultural land in order to comply to the region’s plan for food self-sufficiency. Since 2007, the province’s employers are obliged to pay a minimum wage of $100 to all their employees. Through these actions, the Katangese population regained a good level of quality of life. Moïse Katumbi and his provincial government’s work and results explain the great popularity of the last governor of Great Katanga. The last governor, because to reduce Moïse Katumbi’s influence and power, Joseph Kabila decide to split Katanga into four independent provinces. Moïse Katumbi, the main opponent to the Kabila regime since September 2015, declared he was running for the presidential election in May 2016. He strongly advocates the rule of law and calls Joseph Kabila to respect the Constitution. In 2013, pursuant to the country’s Constitution, Moïse Katumbi announced he would not run for a third governor’s term. However, the central government was slow to organize the new elections. On September 29, 2015, Moïse Katumbi resigned from the presidential party, the PPRD, and from his position of Governor, in a statement highlighting the unconstitutional drifts of the regime, the weakening of the rule of law and individual freedoms. More specifically, he accuses President Kabila of wanting to stay in power longer than the two constitutional terms. As early as 2014, in a famous speech, Moïse Katumbi informed Joseph Kabila of the importance of respecting the limit of two terms. Immediately after his resignation, Moïse Katumbi was subjected to red tape, intimidation, threats and legal harassment from the Kabila regime with political purposes. The Congolese government accuses him of having recruited mercenaries, of having dispossessed a Greek citizen and, in June 2017, of having dual citizenship. Regarding the real estate case, at the end of July 2016, the judge presiding the Lubumbashi tribunal, Chantal Ramzani fled the country and denounced in a letter the serious pressures and physical threats she suffered from the minister of justice, the Presidency of the Republic and the ANR, to get her to condemn Moïse Katumbi. In an article in Le Monde, dated September 22, 2016, she explained these threats in detail. She will be interviewed on TV5 Monde and France 24 on this topic. About the so-called mercenary affair, the American government contradicts the Congolese ministry of justice and refutes the presence in DRC of American citizens with such activities. Additionally, these affairs were condemned by the Conférence Episcopale des Evêques (Episcopal conference of bishops) (CENCO) in a report dated March 2017. They state that they are “masquerades” created with the sole purpose of “preventing Moïse Katumbi from being elected”. When he resigned from the PPRD and his position of governor of Katanga, in a famous statement, Moise Katumbi, called on the dynamic forces of the Democratic Republic of Congo to come together to defend the rule of law and to obtain the respect of their rights. On December 19, 2015, Moise Katumbi signed the declaration of the “Front citoyen 2016”, a coalition of the opposition and the Congolese society, committed to protecting the Constitution and the respect of the 2016 electoral calendar. In June 2016, the Congolese opposition created the Rassemblement, which Moïse Katumbi joined. In spite of repeated attacks by the government trying to poach its members, the Rassemblement remained united and determined to defend the Congolese Constitution and to oppose dictatorship. In December 2016, the dialogue between opposition and presidential majority, under the auspices of CENCO led to an inclusive agreement thanks to Moise Katumbi’s sacrifice. Indeed, in spite of his unresolved situation, which was an absolute condition of this dialogue, Moïse Katumbi accepted that the opposition representatives sign the agreement. He asked for his case to be studied by the bishops. This analysis resulted in the “CENCO report”, which clearly exonerates Moise Katumbi and calls for his prompt return, in order to be able to run as candidate and campaign freely for the presidential election (find out more about the CENCO report). On June 13, 2017, in response to an official claim made in Geneva by Moïse Katumbi, the UN Office of the High Commissioner for Human Rights officially asked the Congolese government to allow the opponent to go back safely to his country and be candidate to the presidency. In spite of the lack of positive response of the Congolese government, Moïse Katumbi announced on June 17, 2017, his intention to return as soon as possible in order to lead his campaign. Moise Katumbi’s commitment and his project for Congo.